Bousillage, a mixture of clay and straw or Spanish moss used for insulation, is a distinguishing feature of Louisiana's architectural past. A photograph of a Bousillage wall. Bousillage refers to a mixture of clay and vegetal binder, such as straw or Spanish moss, that forms the exterior walls of wooden buildings. 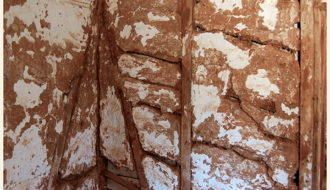 Bousillage is a type of clay insulation common to the vernacular architecture of Francophone communities in France, Canada, the French Antilles, and the former colonial French outposts in the Mississippi Valley, including Louisiana. In French Louisiana, bousillage refers to a mixture of clay and vegetal binder, such as straw or Spanish moss, that forms the exterior walls of wooden buildings. This earthen composite is also used to seal the gaps between boards of buildings. The term is derived from the French bouse, or cow dung. 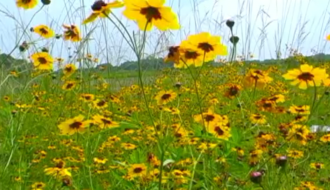 When used as a transitive verb, bousiller literally translates as “to fill up with dung.” Bousillage in Louisiana, however, is a kind of adobe or wattle and daub composed of locally collected loess soil and clay deposits mixed with a vegetal binder. Binding materials include Spanish moss, straw, animal hair, or other fibrous materials that increase the tensile strength of the application. Some builders occasionally add lime to the mixture. At the end of the nineteenth century, New Orleans native and local-color writer George Washington Cable recorded in his notes the process that people of Acadian descent used to produce bousillage: “Adobe [was] made by making layers of clay & moss with pit wetting [saturating] with water and everybody men, women & children get in & tramp. Make into rolls 2 feet long & lay over the pins & bend down at ends—smooth by hand & whitewash.” Vernacular Creole architecture, particularly in raised Creole cottages, also utilized this construction technique. Home builders placed this insulating material by torche entre poteaux. Torche means the amount of bousillage that an individual can hold in two hands; entre poteaux is an architectural design that consists of clissage—a latticework of non-load-bearing wooden batons, or barreaux—which gives the structure form and rigidity while supporting the substantial weight of the bousillage. In Louisiana, barreaux were arranged horizontally between studs and joists, as opposed to vertically as in the European tradition, and they supported walls that were often as much as one foot thick. When bousillage was molded into bricks infilling between studs, Francophones termed the application briquette entre poteaux. This earthen mixture was also used as infill between the cracks of colombage, or timber-frame houses. 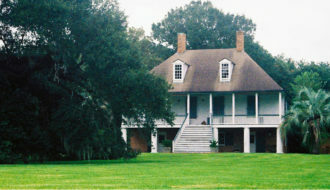 Today bousillage is a characteristic feature of Louisiana’s architectural past. 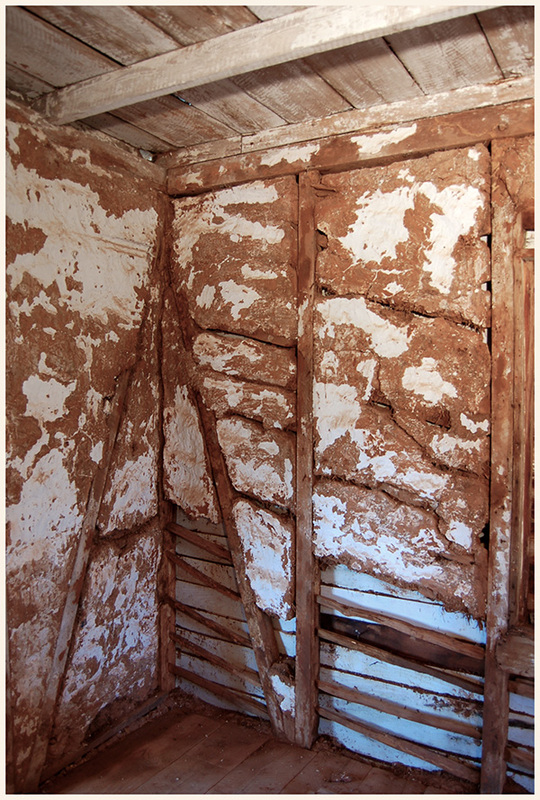 In the era before air conditioning, this practical form of insulation effectively cooled structures by adjusting the humidity inside the building: the thick earthen walls absorbed excess moisture while protecting the interior from radiant heat. Contemporary architectural design in Louisiana follows conventional methods used in other parts of the American South, forgoing bousillage for fiberglass insulation and brick, wooden, or sheetrock walls. Staff of the Louisiana Endowment for the Humanities "Bousillage." In https://64parishes.org Encyclopedia of Louisiana, edited by David Johnson. Louisiana Endowment for the Humanities, 2010–. 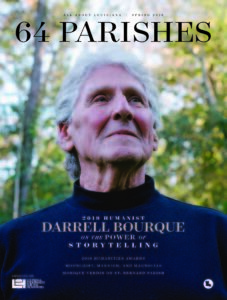 Article published June 4, 2013. https://64parishes.org/entry/bousillage. Edwards, Jay Dearborn, and Nicholas Kariouk Pecquet Bellay de Verton. A Creole Lexicon: Architecture, Landscape, People. Baton Rouge: Louisiana State University Press, 2004. Fricker, Jonathan, Donna Fricker, and Patricia L. Duncan. 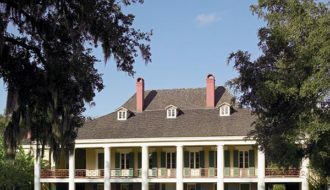 Louisiana Architecture: A Handbook on Styles. Lafayette: University of Louisiana at Lafayette Press, 1998.